Warm weather is coming soon and the kids are ready to get outside and play! Swing-N-Slide wants to remind families that compliant backyard recreation is the safest way to play. Outdoor play is important for building a child’s cognitive, social, emotional, and physical development. Checking your play set for wear and tear will allow for longer and more productive play time. Check all nuts and bolts twice monthly for tightness and tighten as required. Playsets can last for many years if they are properly cared for and monitored. It’s important to replace deteriorated swings and parts or upgrade for your growing child. Swing-N-Slide offers many alternatives to your basic swing seat including a heavy duty swing seat, the innovative Vortex Ring Swing, the modern Wind Rider Glider or even a multi-child swing like the Mega Rider or the 2 For Fun Glider. The most important aspect in play is safety. 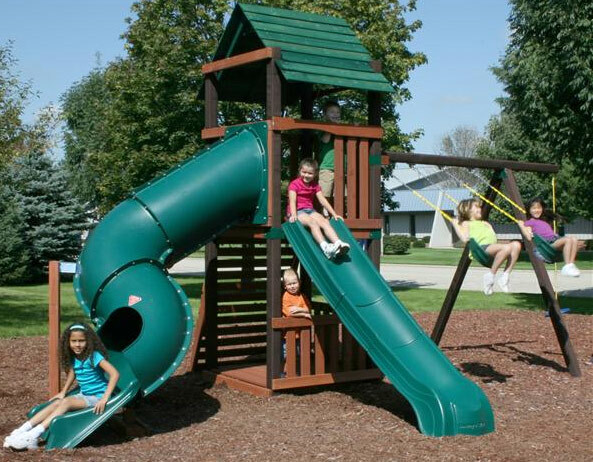 Swing-N-Slide tests and adheres to the ASTM International regulations for residential play. To learn more on playset safety visit www.swing-n-slide.com for ASTM compliance information and how Swing-N-Slide meets or exceeds regulations for safe backyard play. 1 Day FLASH GIVEAWAY - Win 4 Tickets to Marvel Universe Live! Ringling Bros. Has Hatched Something Big ... Dragons! North Texas Kids is dedicated to bringing you the best in parenting resources in the North Texas area. Powered by WordPress | Log in | Entries (RSS) | Comments (RSS) | Copyright © 2019 Scissortail Publishing. All rights reserved.